Digester Cleaning is fast becoming an established business sector within the Anaerobic digestion industry. In the UK half a dozen companies actively market their service specifically to the AD and biogas sector. The build-up of grit and debris in biogas plant reactors is all too often being found to negatively impact the operation of digesters, and severely reduce biogas yield, as more AD Plants come on stream, and existing plants age. Watch the video which we have produced to allow you to watch the main content of this page instead of reading it. Early AD plant designers often paid too little attention to the build-up of unwanted materials in reactors, but now there are more powerful mixing systems which, to some extent can re-mobilise and re-suspend silty materials and reduce this problem. The Landia GasMix is one such product. Some digester designs now include for digester cleaning in a “hopper-like” funnel shaping to the base of these tanks, to allow withdrawal of silt etc., from the tank bottoms during normal digester operation. When this occurs, immediate and thorough digester tank cleaning is required. At this point the wise anaerobic digestion plant operator will seek to appoint a professional digester cleaning contractor to come and as rapidly as possible clean – out the problem digester tank or tanks. This is a painful process for biogas plant operators, due to the inevitable lost production time and loss of biogas plant revenue. … trained and experienced personnel …deployed with all of the necessary flushing, pumping, venting and safety equipment, to quickly and safely remove all organic and inorganic materials that interfere with the operation of the digester. Using pressurized water they can remove, transport and dispose of residual solids. Remaining material is slurried into a semi-liquid form and easily removed and discharged using pumps that operate at up to 4,500 gpm. And, do it as quickly as possible. The Digester Cleaning Contractor will normally also be tasked with treating the water content of the digester. 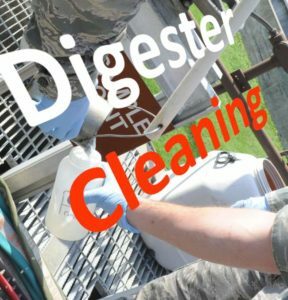 Therefore, all digester cleaning contractors worthy of the name nowadays, base their cleaning bids on using their own specialised dewatering and water treatment machinery. The result is that they provide an indispensable service to biogas plant operators by bringing overloaded and even inoperable digester tanks back to full operating capacity. Overloading, lack of adequate mixing, loss of gas recovery, or grit and trash, can cause a wastewater digester to slow-down and function at only a small percentage of its designed capacity, or not at all. But this is not a reason to close down a biogas plant because highly trained and experienced personnel are available. These are trained specialists who can be deployed with all of the necessary digester cleaning equipment to quickly and safely remove all organic and inorganic materials that interfere with the operation of a digester. Hydro-blasting is used to mobilise settled silt, and to meet any of the Client’s high-pressure application needs. Removal of residual sludge from digesters and other storage and process tanks can often be unexpectedly challenging. The material itself is often very dense and gritty with significant amounts of large debris. The work environment is harsh and often requires confined space entry. Successful completion of these types of projects requires a contractor specialised in handling challenges such as these. via Digester & Sludge Tank Cleaning | Burch Hydro Inc. Finally, all digester cleaning projects hold plenty of potential hazards for injury or even death. All confined space entry, for example, will require to be done to the highest health and safety standards, to avoid either explosion or asphyxiation. We hope you found this video useful, and if so. Do please return later for more news. But, why not subscribe to our Newsletter now, and avoid missing our articles? Also, do please give us your feedback and comments! Will Green Investment Bank Sell-Off Continue Its Social Purpose? How long does it usually take to clean the digester, assuming it is 300m^3? I just did a quick Google search for tank cleaning Toronto and saw a company offering tank cleaning at http://www.bio-enpower.com/ It looks, at a quick glance, that they might be able to settle out the inert sludge, they can certainly remove the plastic etc., and the organic content might then be fed into their digester. If I were you I would try contacting a local tank cleaning company and asking them. 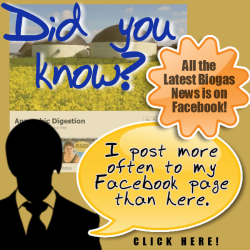 Hi, My name is Jeff, I work as a Internet Business Analyst, and was doing research for another client when I came across your site anaerobic-digestion.com. and thought I would message you. After doing a quick analysis of your website, I noticed a couple of issues that are most likely causing people to leave without making contact with you about digester cleaning. This includes choice of subject by keywords, and I can tell you that you need to optimize much better. I offer you exclusive training on this and other ways to get more visitors. Just get back to me and I’ll give you our training course details.